Epidermal Growth Factor Receptor (EGFR) is a member of the type I transmembrane tyrosine kinase-associated receptors; other members of this superfamily include ErbB2, ErbB3, and ErbB4. The overexpression of ErbB members mediates the progression of different types of cancer and some novel treatments has been successfully developed to block EGFR (Cetuximab) and ErbB2 (Trastuzumab). Whether ErbB3 and ErbB4 play a similar role in cancer is still under investigation. In addition to cancer pathology, ErbB receptors play also a vital role in the development of organs, repair of tissues and renal pathology. 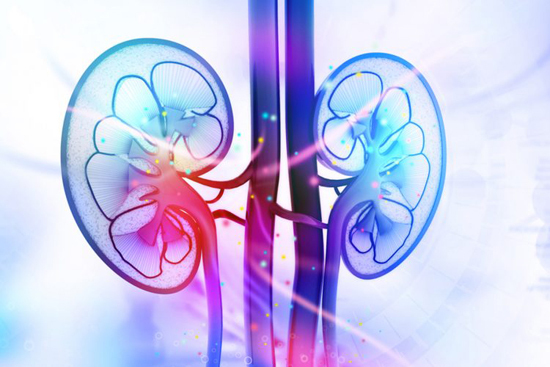 Previous studies showed activation of EGFR triggers renal tubulointerstitial fibrosis (TIF) which can predict the development and progression of chronic kidney disease. However, does other ErbB family receptors play any role in TIF is still unknown. Recently, scientists at the Vanderbilt University Medical Center led by Professor Raymond Harris demonstrated vital role of ErbB4 in the development and progression of renal fibrosis in chronic kidney disease. The research work is now published in the American Journal of Physiology-Renal Physiology. The authors found low levels of ErbB4 expression in the cytoplasm and perinuclear area of tubular epithelial cells in normal human kidneys. The expression of ErbB4 slightly increased in kidneys with mild renal ﬁbrosis and decreased in kidneys with moderate or severe ﬁbrosis. The authors also observed low levels of ErbB4 and undetectable levels of p-ErbB4 in sham-operated and wild-type kidneys while the expression of total and phosphorylated receptor increased significantly in wild-type kidneys after Unilateral Ureteral Obstruction (UUO) injury. However, ErbB4 expression was not detected in ErbB4-1-ht+ kidneys after UUO injury. In addition, the research team found that tubulointerstitial changes were more pronounced in UUO kidneys from ErbB4-1-ht+ mice at day 6 while minimal tubulointerstitial changes were detected in UUO kidneys from wild-type mice. The authors also observed high expressions of H-FABP in the thick ascending limb and distal tubules of UUO kidneys from ErbB4-1-ht+ mice compared with the tubules of UUO kidneys from the wild-type mice at day 6. Also, renal fibrosis was apparent in UUO kidneys from ErbB4-1-ht+ mice at day 3 and UUO kidneys from wild-type mice at day 6. p-Histone H3 and Ki-67 were found to be rarely expressed in either the interstitial or tubular epithelial cells of UUO kidneys from ErbB4-1-ht+ mice and wild-type mice. However, increased levels of p-Histone H3 and p-Histone H3/Ki-67 ratio was observed in UUO kidneys from ErbB4-1-ht+ mice compared with the UUO kidneys from wild-type mice. Although significant changes were not detected in the expression levels of NRG1 in the sham and UUO, the expression levels of HB-EGF reached the highest level at day 6 after UUO injury in ErbB4 deletion mice. The expression levels of nuclear snail1, E-cadherin, vimentin, p-p38, nuclear immunostaining of yes-associated protein and p-Smad3 increased signiﬁcantly in UUO kidneys from ErbB4-1-ht+ mice compared with UUO kidneys from wild-type and sham-operated kidneys. The study identified the novel role of ErbB4 “absence” in the development and progression of renal ﬁbrosis after renal injury. The findings of Professor Raymond Harris and colleagues will advance further studies on the prevention of tubulointerstitial development via the increased expression of ErbB4 in kidneys with chronic injuries. Zeng, F., Miyazawa, T., Kloepfer, L.A., and Harris, R.C. ErbB4 deletion accelerates renal ﬁbrosis following renal injury, American Journal of Physiology-Renal Physiology (2018) 314, F773–F787.